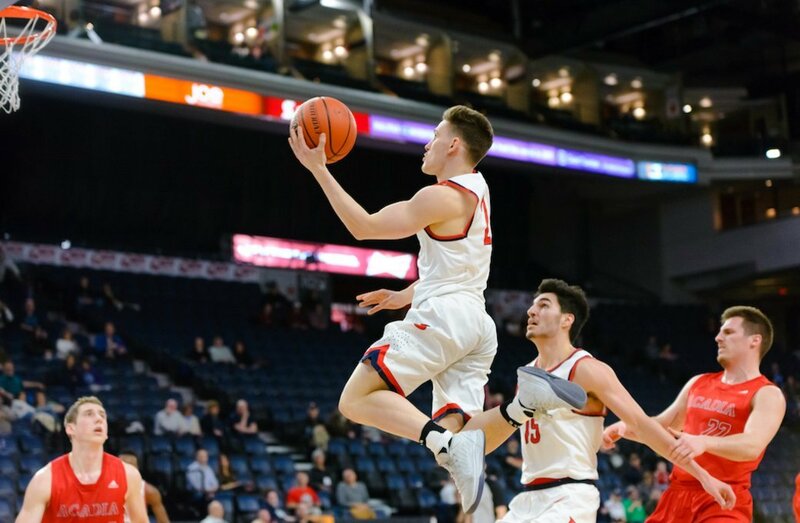 Hungry after their only defeat of the season, the Carleton Ravens came away with the bronze medal after downing the McGill Redmen 76-71 Sunday afternoon. Following the first quarter, the Redmen controlled the lead for most of the game. But the championship pedigree of the Ravens paid off in the end, where they outscored their opponent 28-19 in the fourth. “We’re young, we have talent and generally we play hard. But because of our youth, we get in our comfort zone a lot. 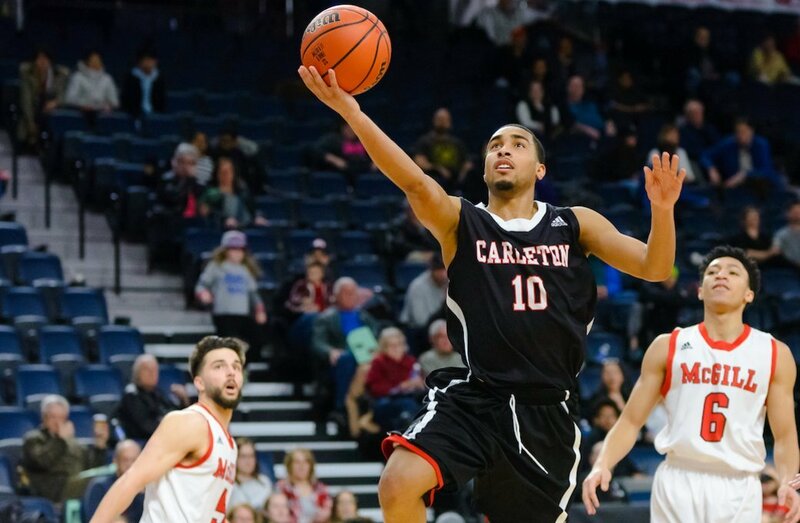 Sometimes you don’t play as hard as you have to play,” said Carleton head coach Dave Smart. The Ravens had four players in double figures. Eddie Ekiyor finished with a game-high 21 points, while Yasiin Joseph and reserve TJ Lall recorded 16 and 14, respectively. But it was Marcus Anderson who drilled a pair of big threes to cement the win. He finished with 10. Carleton jumped out of the gate with a 9-0 run. McGill’s Dele Ogundokun broke the goose egg with a triple, but it took almost five minutes to do so. The Redmen built off that and finished the quarter on a mini 6-3 run to inch closer to the Ravens 12-9. The team from Quebec played with a lot more confidence in the second quarter and started to find rhythm in their offence. 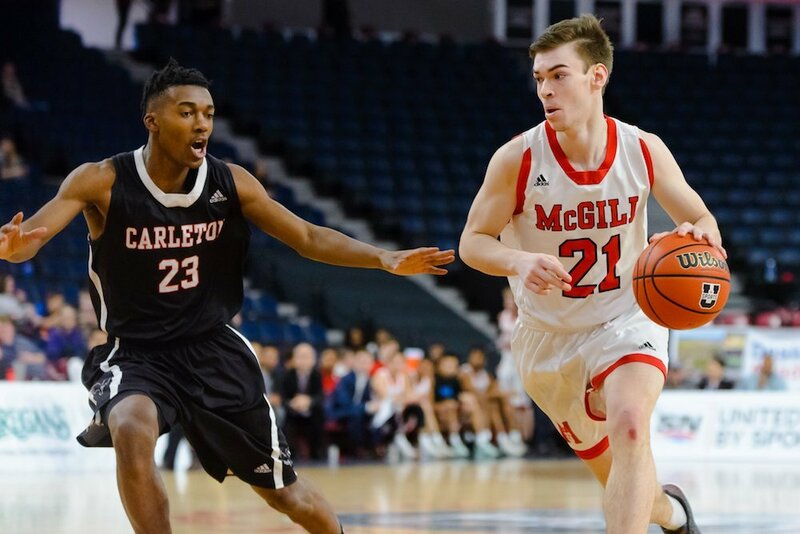 After a couple lead changes, McGill went on a late surge with three consecutive triples by Jenning Leung, Alex Paquin and Noah Daoust to pull ahead 30-21. Paquin led all-scorers at the break with nine of his team-high 17 points, where the Redmen carried a 34-24 advantage. Teammates Ogundokum (14), Leung (12) and Francois Bourque (11) also finished in double figures. After their lead was trimmed to five, McGill deployed the full-court press and it worked for a brief period as they pushed their lead back up to 10, 44-34. Ekiyor took over late in the third scoring eight of his team’s final 12 points in the third quarter to put his Ravens in reaching distance of McGill, 52-48. Lall had a masterful performance in the fourth quarter where he scored all 14 of his points (on 5-of-6 shooting) and the Ravens carried that momentum to a bronze medal finish, 76-71.